What if there was a machine that could automatically collect rubble from torn-down buildings and transform the material into new bricks? That’s exactly what designers Youngwoo Park, Hoyoung Lee and Miyeon Kim are proposing with their “Return Brick” recycling machine, which could help keep construction materials out of the landfill. The little robotic machine would search for small fragments of brick and concrete, grind them up, and reform those pieces into new Lego-like bricks, which are easier to stack and build with. 89% of construction waste is brick and concrete, so there is a large amount of material that could be recycled if only it were properly collected. 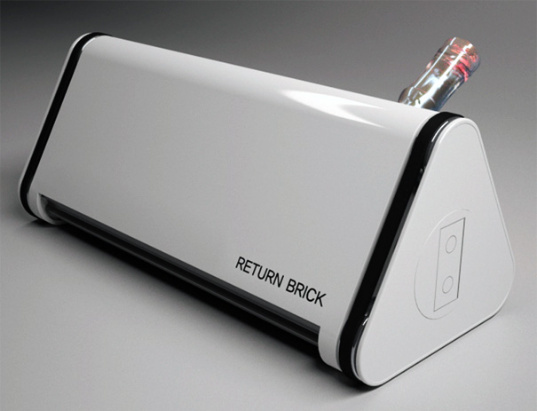 Return Brick is a small robot that rolls around trolling for rubble, sucking up small pieces of concrete and brick. After it has enough material, the crusher begins to break the waste down into even smaller bits and then water or a hardening agent is sprayed onto the material. Next a compressor forms the powdered material into a solid brick and spits it out the side. The newly formed bricks looks a bit like a Lego blocks and stack the same way, overlapping and connecting with the pegs and the holes. 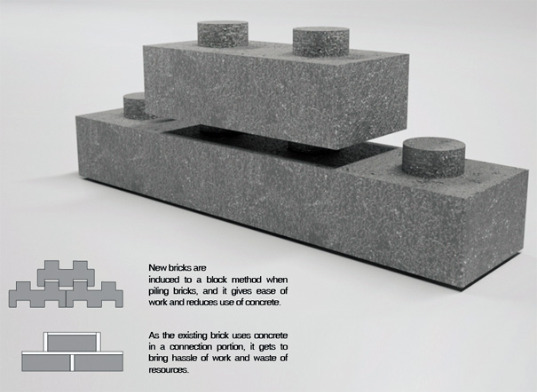 In theory, the newly formed brick provides similar structural stability with less material. If only a machine like this already existed — it would be perfect to help in the reconstruction of Haiti after the earthquake. Companies should already be working in Haiti to recycle the debris in order to rebuild, but with this robot they could rebuild even quicker. Due to unprecedented floods lot of houses Even roads have been damaged in Himalaya.Whether we can opt your technology comfortably. What is the quality of these bricks? What is the most likely structures the use of these bricks would be applied for? I dont really think everybody's negative attitude is helping in any way. Just because this gadget might not meet your expectations now doesn't mean it can't in the future. I like the idea of "recycling on the job". I hope that this passes any test given to it and that it leads to more ideas. This things seems to lack any scale to be relevant. The idea of reusing material is great. I do work with compressed earth blocks which utilizes a similar process. But this little thing is a toy. I am working on a LEED platinum building project right now and we are already diverting well over 90% of our waste. I would like to see that little thing go through the 500 tons of material we sent off just today for recycling. Nice product design, but it won't really work. Good for play toys, but nothing like the real thing - real fired clay brick! Many imitators, no equals. While i like to commend the innovation,i have concern for the strenght of the materials,Structural stability and integrity of the buildings that will be produced from the tech.But, let,s work on it. I also like to make my contributions from Nigeria. Great Idea, Looks like an Iphone though. Hmmm. Great in concept (and fun! ), but I'm not so sure Haiti deserves to be saddled with un-tested, un-specified material strengths with brittle properties. That would lead to a nearly identical collapse in a future seismic event. *gasps* Amazing!!!! Where can I buy one? What if there was a machine that could automatically collect rubble from torn-down buildings and transform the material into new bricks? That's exactly what designers Youngwoo Park, Hoyoung Lee and Miyeon Kim are proposing with their "Return Brick" recycling machine, which could help keep construction materials out of the landfill. The little robotic machine would search for small fragments of brick and concrete, grind them up, and reform those pieces into new Lego-like bricks, which are easier to stack and build with.